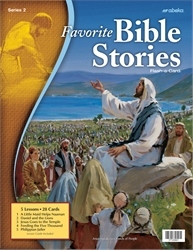 Travel from the Old Testament to the New Testament with these Bible favorite stories! These brightly colored flash-a-cards depict the stories of Naaman, Daniel, the Philippian jailer, and Jesus at the temple and feeding the 5,000. With 5 lessons and 30 picture cards you will capture the attention of your child and expose him to doctrinal truths within the Word of God. Give your students practical life lessons taken straight from the Word of God with this favorite set.